Resistors are passive electrical components that reduce the flow of electrical current in a circuit. They are one of the most common components and can be found in almost every electrical networks and electronic circuit. The resistance is expressed in ohms. There are many different resistor types and constructions. They applications for resistors vary widely: generating heat, delimit current or create a voltage drop, measure physical quantities are only a few examples. 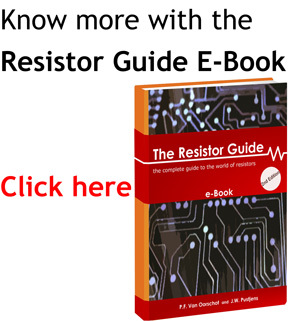 The resistance of a resistor is its primary parameter. Resistance is expressed in Ohm (Ω) and is dependent on the shape of the resistive part and the material properties. The longer the path the current has to travel across the resistor, the higher the resistance will be. The extent to which a material is resistant to electric current is called resistivity. The symbol for resistivity is ρ (W.m). The higher the resistivity of a material, the higher the resistance will be. Good resistor materials have resistivity’s between 2•10^-8 and 200•10^-8 W•m. The Kirchhoff circuit laws form the basis of electrical network theory. They are based on the principle of conservation of electrical charge and energy. The Kirchhoff Current Law, or first law, states that the sum of currents from one node is zero. The Kirchhoff Voltage Law, or second law, states the sum of voltage drops and rises in a closed loop of a network is zero. 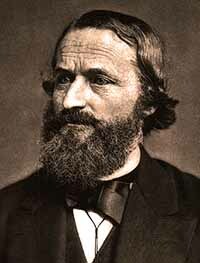 Together with Ohm’s law, the Kirchhoff laws make it possible to solve complex electrical networks. For some situations such has high gain amplifiers in audio applications, resistor noise is an unwanted phenomenon. Some resistors have better noise properties than others. Metal foil is amongst the best, while carbon composition possesses the worst noise properties. The relation between resistance and temperature is defined in the Temperature Coefficient of Resistance (TCR), which is measured in ppm/°C. It is mainly dependent on the resistive material properties, but also on the construction of the resistor. The power rating (in watts) of a resistor is a measure of the maximum energy a resistor can dissipate without damaging or altering the properties. Based on the operating conditions and environment, the nominal power rating can decrease. For example, when the ambient temperature is higher, the resistor is de-rated to a lower value. This is expressed in a so called derating chart. An ideal resistor has only resistance and no inductive or capacitive properties. Practical resistors have some series inductance and parallel capacitance. For high frequency circuits these parasitic effects can cause problems. Especially wirewound resistors are known for their bad high frequency properties.